I have been suffered enough…from Blog.com! As a paid customer, my blog has been keeping down and down for days and there is no response from their support team. After recent 3-day down, I find my recent post is lost! 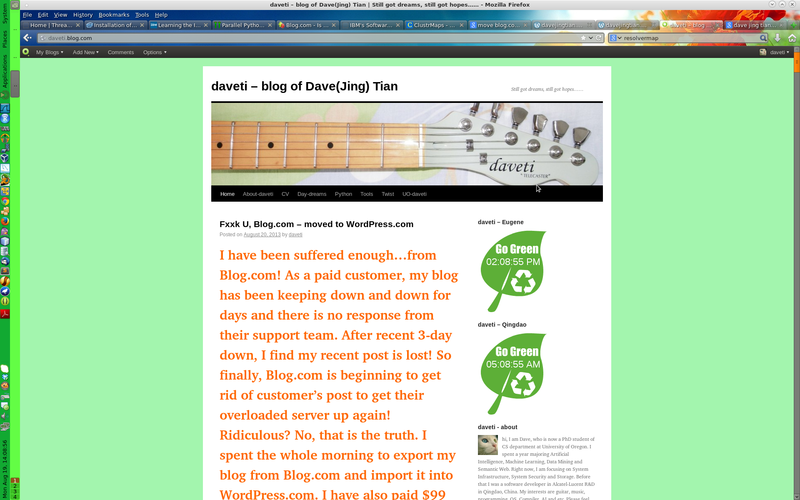 So finally, Blog.com is beginning to get rid of customer’s post to get their overloaded server up again! Ridiculous? No, that is the truth. I spent the whole morning to export my blog from Blog.com and import it into WordPress.com. I have also paid $99 to promote my account there. Hope everything goes well here. This entry was posted in Uncategorized and tagged blog.com. Bookmark the permalink. I am having the same problem. I can not stand the fact that Blog.com is always down! They are owned by WordPress.com !